Which countries are in double-dip recession like the UK? "Britain has gone from a tepid recovery to being deep in a double-dip recession — the only G20 country apart from Italy to be in this much trouble"
Bleak economic statistics were released this week by the Office for National Statistics (ONS), showing UK Gross Domestic Product (GDP) fell by 0.7 per cent in the second quarter of 2012 compared to the previous three months. It continues what has been dubbed the UK's 'double-dip' recession following the long period of economic contraction experienced by the UK in 2008 and 2009. 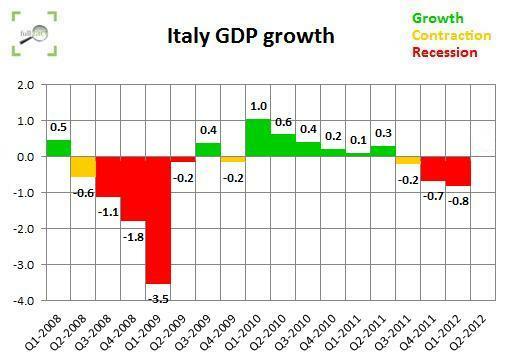 The Guardian's claim this morning that only the UK and Italy are suffering the from a second stint in recession echoes a claim circulated by the Labour party last month, highlighting how badly the UK is doing compared to other large economies. There is actually no official definition of recession, although it has come to be understood as occuring when a country experiences two successive periods of shrinking economic output. In the UK, this means two consecutive quarters (three-month periods) of negative GDP. The Organisation for Economic Cooperation and Development (OECD) helpfully compile and make available a database detailing changes in GDP across the developed economies. From this we can look at GDP figures since the start 2008 for all 20 members of the G20 (Argentina, Australia, Brazil, Canada, China, France, Germany, India, Indonesia, Italy, Japan, South Korea, Mexico, Russia, Saudi Arabia, South Africa, Turkey, the UK, the USA, and the European Union). If we take the commonly-used definition of recession, every G20 country bar Australia, China, India, Indonesia and South Korea entered recession at the end of 2008 or the start of 2009. By the third quarter of 2009, each of these countries had left recession and returned to positive growth. There are obvious drawbacks to simply defining recessions like this as it doesn't take into account the size of the slumps in output. Russia, for example, experienced a much more severe economic contraction than the UK (experiencing quarterly shrinkage as high as 4.7 per cent compared to the UK's trough of 2.1 per cent) back in 2008/9, yet Russia hasn't fallen back into the red since. Also, a sustained period of negative growth could be interrupted by just one quarter of positive or zero growth which would break the recession into 'two' dips, while some would prefer to see this as part of the same recession period. Iceland, for instance, experienced almost ten successive quarters of contraction from 2008 to 2010, broken by only one quarter showing faint growth at the end of 2008. While this might suggest a 'double dip' recession, the brief period of expansion could easily be an anomoly caused by exceptional circumstances. It's also worth looking beyond the G20 for more context. While the UK and Italy are the only G20 countries to be in a second period of recession, they're joined by Spain, Portugal, Hungary and the Czech Republic when we consider all OECD countries (data on Greece isn't recently available in a quarterly format, although what information we have also shows annual falls in output). Similarly, if we look at those countries that have been through a 'double dip' recession but have since returned to growth, seven more countries can be added to the list: Denmark, Iceland, Japan, Luxembourg, Netherlands, New Zealand and Slovenia. The UK and Italy are indeed the only G20 countries currently experiencing a double-dip recession, however other countries beyond this group are suffering from similar economic woes. A wider look at OECD countries shows that five more are currently in double-dips of their own, while seven further countries have also double-dipped since 2008 but since returned to growth. However a potentially more useful measure is to analyse how each country is faring compared to its 'peak' GDP before the financial crisis struck. On this measure, the UK and Italy are also faring worse than their G20 counterparts. 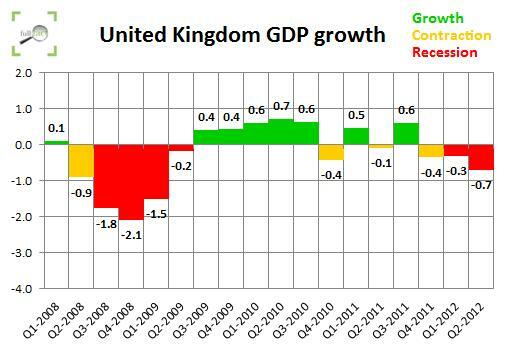 Is the UK economy growing four times slower than the US? Does the UK have the third worst economic performance among G20 nations?